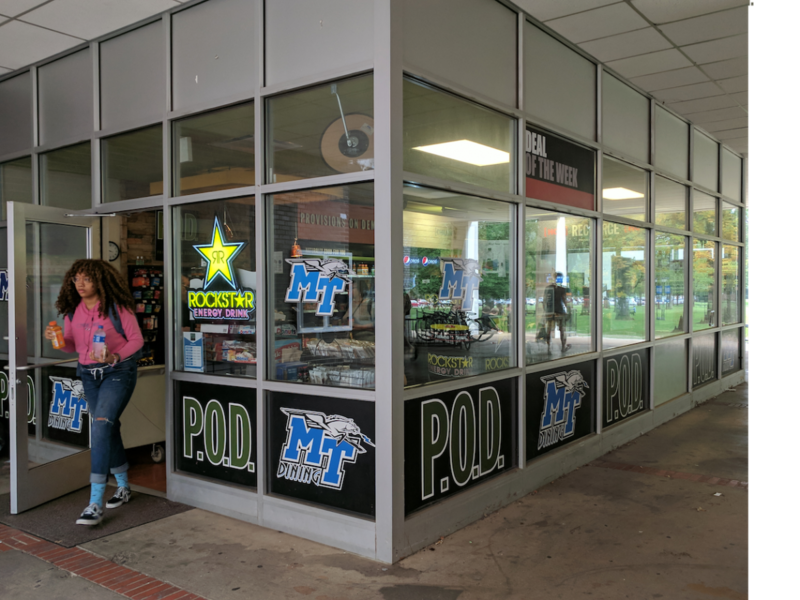 MTSU Faculty Spotlight: John D..
—Jamba Juice: this snack choice is only available at the Student Union P.O.D., but even if you’re not nearby, it’s completely worth the extra walking. These sweet, cold, fruit-filled smoothies are the perfect snack for a hot day, and one of the healthiest food choices you can make on campus. The P.O.D. offers two flavors at any time, but they rotate the flavors every couple of months, so be sure to keep coming back to try new ones. —Stay Awake bars: Okay, so these chocolate bars don’t really count as a quick meal (as they’re mostly sugar and caffeine), but if you’re on your way to a night class, you’ll definitely want to grab one. These candy-like bars promise to deliver the benefits of an energy drink without the headaches and jitters (although if you’re very caffeine-sensitive, you’ll still want to avoid them). They’ll give you a jolt of energy to get you through that late-night cramming. —Sushi: I know, it seems a little sketchy to buy sushi from a mini-market, but I’ve personally never had an issue with the taste or freshness of P.O.D. sushi. Each box is made fresh on campus daily at the Asian Express in the KUC, and because it’s mostly lean fish and rice, it’s one of the healthiest meals you can grab at the P.O.D. (not to mention no microwave time needed). —Hot Pockets: I just love the convenience and the variety of Hot Pockets. Buy one, microwave it, then keep it in its cardboard sleeve to eat as you make a mad dash to class. They come in a bunch of flavors and all of them have enough protein to keep you focused through class. —Chocolate milk: The P.O.D. chocolate milk is legendary on campus. It’s practically a rite of passage: if you haven’t tried it yet, you need to. You might not graduate otherwise. Seriously though, this milk might not seem like a lot, but it’s got enough protein and calcium to keep you focused through class, and enough sugar to keep you awake, making it a great choice if you need a little boost but you’re not hungry enough for a full meal. —Sandwiches: Let me warn you: any kind of P.O.D. sandwich is probably going to disappoint you. The cold ones are typically soggy, with flavorless meat and questionable lettuce. The hot ones are a little overcooked and stale (especially if you’re getting them at night) and will probably make you somewhat queasy. And for $6-8 dollars apiece, they’re just not worth it. —Fruit: I know, it’s so tempting to be healthy and grab an apple or a banana from the P.O.D., but in my personal experience, I’ve never encountered a P.O.D. fruit that wasn’t some degree of expired. The bananas are by far the worst, and each container of grapes contains at least a third that are inedible. If you absolutely must have fruit from the P.O.D., either stick with the apples or try the yogurt fruit parfaits, which are amazing.